PE-DESIGN Version 8 has added many new functions to the software and has changed the operation of many features. Digitizing's Sew Easy Version 8 is your comprehensive guide to understanding the new software program. Cynthia's new workbook is a must have manual. Using methods brought from her teaching background, Cynthia has formatted the workbook to make the learning much easier than the average instruction manual. You will find extensive screen shots in the workbook so you know if your screen matches what you see on the paper. 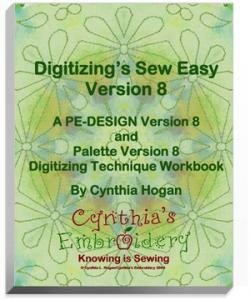 Best of all Digitizing's Sew Easy Version 8 is PRINTED for you. You don't have to go to the hassle of printing out 545 pages of instruction. No problems with the order, I wasn't expecting a spiral bound book but then not sure really what it would be. I found your site when doing a search for the book, and was happy that it was on sale-my first search took me to Amazon and it was much more there. The author was suggested by one of the sewing groups, and I was happy to find something to help me in my digitizing process. So thank you for offering it.